2900 S Laurel Fork Rd. Meadowview offers a nice view of the open meadow and pond. 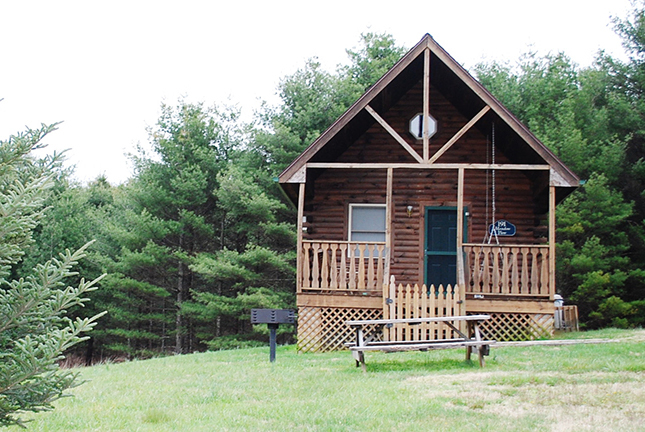 This cabin is a pet free cabin which can sleep up to six guests. There is a queen size bed in the bedroom, queen size sleeper futon in the living room, faces the gas log fireplace, and the loft accessible by ladder can sleep two more. Efficiency style kitchen includes full size refrigerator, build in cook top, microwave, toaster oven, coffee maker, and comes fully stock with cookware and dishes. The bathroom is fully stocked with fresh linens and a hairdryer. The cabin is air conditioned with ceiling fans and cathedral ceilings, baseboard heat, gas log fireplace keeps the cabin warm and cozy on chilly nights. The living room includes satellite TV, DVD player, boardgames, and reading materials as well as a guest book with tips to make your stay more enjoyable.